The most technologically advanced system of internal support on the market. 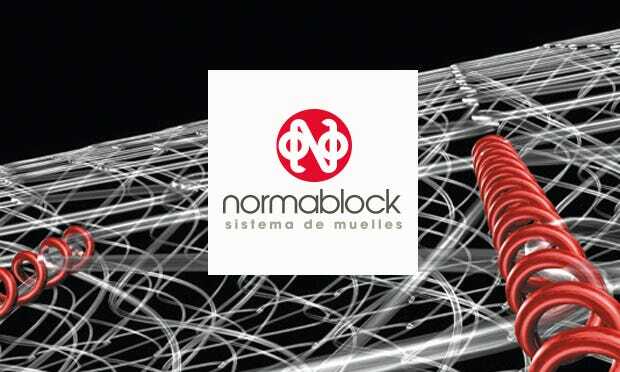 The NORMABLOCK® spring block is the most technologically advanced system of internal support on the market. Its design allows it to combine health and comfort while you sleep, thanks to other features such as independent sleeping zones. Its construction guarantees a long service life for the mattress. The first spring block ever invented used double cone springs, which were independent but rather low-tech. They were characterised by a lack of support and poor ergonomics. The sides were especially problematic and did not adapt to the sleeper’s body shape. The exclusive design and arrangement of NORMABLOCK® ensures your back is positioned correctly and naturally anywhere on the mattress surface, providing the firmness each part of your body needs, thanks to its lumbar support. The NORMABLOCK® spring block is designed to provide greater support for the area of the body that weighs the most: the lumbar zone. The middle third is reinforced with greater spring density, which provides greater resistance to sagging. By preventing the mattress from sagging in the hip zone, NORMABLOCK® keeps your spine aligned, ensuring a completely ergonomic posture. The springs are joined together by coils that span the sleeping surface from head to toe. Thanks to this design, the pressure on each individual spring is transferred to the longitudinally adjacent springs, but not to those located transversely on either side of it, preventing the transfer of pressure from one side of the sleeping surface to the other and creating two totally separate sleeping zones in double beds. The z-shaped spring design increases the coil density on the sleeping surface, eliminating any possible gaps and permitting the support to be transferred evenly to the body. The spring design extends the support features to the edges of the mattress, making the entire surface area apt for sleeping. The sides are more resistant because of the reinforced perimeter, making the mattress more durable in the area where it is used the most. All the spring block components receive a thermal treatment that ensures suitable elasticity and guarantees the full recovery of the initial shape.